Figuring it all out on your own -- from scratch -- isn't necessary when the work has already been done for you. This manual offers a fundamental approach to learning how to provide accurate realtime translation services with EclipseVox and Dragon Naturally Speaking v.13 (Professional and Premium editions). Accompanying this manual is a Setup Files CD that provides files for NaturallySpeaking and EclipseVox so you can instantly benefit from previously-done voice+CAT setup work instead of having to do all that work yourself from scratch. For information about student discounts and volume discounts for schools call 800.800.1759, or email sales@eclipsecat.com. 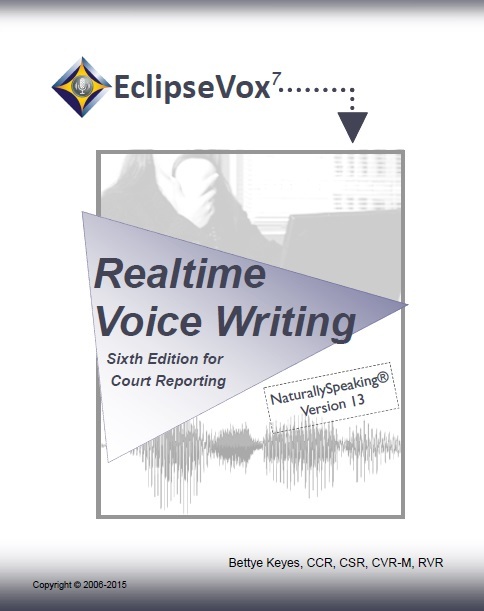 "I'm a steno reporter who recently transitioned to voice writing utilizing EclipseVox. First, let me just say that I can't believe how much I'm actually enjoying it. Second, The Realtime Voice Writing book and Setup Files CD is amazing. It literally gives step-by-step instructions along with the CD and makes the process of learning realtime voice writing so much less confusing. I will admit I was a little nervous and overwhelmed before starting. Once I started and I saw how you are walked through everything, I became so much more confident with what I was doing. I'm really excited about how good my accuracy is! With just a little more practice on my speed, I'll be ready to consider myself a realtime voice writer!!! Thank you, Bettye, for everything. I would have NEVER been able to achieve this without you."